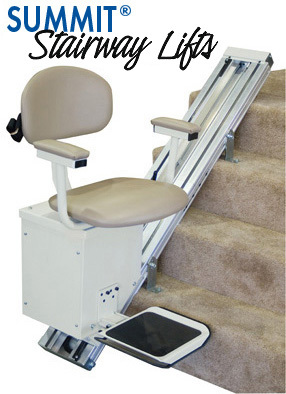 Summit Stairlifts can be self-installed! Or, our trained experts can do the work for you, quickly and affordably. The need for secure support is paramount. It’s why the armrests are extra rigid and why Summit seats swivel exactly as they do. It’s also why our back rest is adjustable, and they use air-craft cable rated up to 4,200 lbs. on a drive system that has withstood the test of time for more than 50 years. 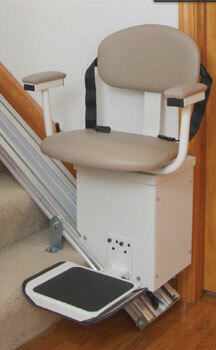 Safety sensors do not allow the lift to run unless the seat is in the proper position. Designed for fast, easy installation. The reason they are so easy to install is because the hard part is done at the factory. The carriage is pre-installed on a short section of track. Installation is not much more complex than connecting a length of track, attaching it to the stairs, bolting down the seat, and plugging it in. The installation instructions are clearly illustrated and very detailed, plus expert advice is never more than a phone call away. The backrest has three different settings, and the fold-up footrest adjusts to two different heights for the utmost in custom comfort. 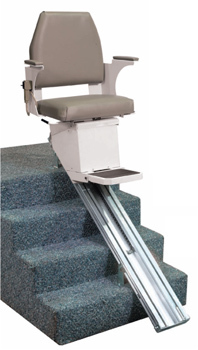 The seat swivels 90° towards the landing at both top and bottom to address bending, balancing and twisting issues when transitioning to and from the lift. The spacious, wide seat features thick padding and attractive upholstery. The unit-control switch requires little manual dexterity to operate and is conveniently located at the end of the armrest. Capacity: 350 lbs. (one person) MAX: 500 lbs.